Struggling Fulham's winless streak extended to six games following an entertaining draw against Birmingham. The visitors dominated early on and were rewarded when Rohan Ince's driven shot squeezed past Tomasz Kuszczak. Michael Morrison's firm header from David Cotterill's accurate cross drew Blues level shortly after half-time. Birmingham nearly won it late on as David Davis' shot hit the post before Clayton Donaldson fired the rebound over the crossbar. The result meant Fulham dropped down to 21st place, just one point above the drop zone, while Birmingham remained ninth, six points off a play-off place. Despite their poor recent form, Fulham flew out of the blocks as Emerson Hyndman and Scott Parker had great chances to open the scoring. They were soon rewarded for their early dominance as Ince, on loan from Brighton, opened his account for the club. On the stroke of half-time, Jonathan Spector's header from Cotterill's free-kick was magnificently saved by Marcus Bettinelli, but the keeper was helpless after the break to stop Morrison from equalising. Fulham have won just twice in 15 games under Slavisa Jokanovic. The Serb, who led Watford to the Premier League last season, has eight games to keep his side from dropping into League One. "It's a little bit like the Wolves game, we've chucked everything at it. "We've had chances again, it's just not falling for us at the moment and it's really disappointing. "Unfortunately it doesn't seem like we can kill teams off at the moment." "We were very competitive today. At this moment, we've got a month and a half until the end of the season. "We played good football against a team in the top half, but we didn't win. It's a point and if you cannot win three, it's important you get one. "Our future is in our hands and we'll fight until the last second. Let's be brave, intelligent and play with desire like we did today." Match ends, Birmingham City 1, Fulham 1. 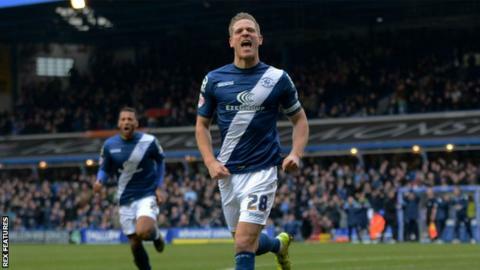 Second Half ends, Birmingham City 1, Fulham 1. Attempt blocked. James Vaughan (Birmingham City) right footed shot from outside the box is blocked. Assisted by Michael Morrison with a headed pass. Marcus Bettinelli (Fulham) is shown the yellow card. Attempt blocked. David Davis (Birmingham City) right footed shot from outside the box is blocked. Assisted by James Vaughan. Attempt missed. Matt Smith (Fulham) header from the centre of the box is high and wide to the left. Assisted by Ross McCormack with a cross following a corner. Corner, Fulham. Conceded by David Davis. Attempt missed. Scott Parker (Fulham) right footed shot from outside the box is too high. Ryan Fredericks (Fulham) is shown the yellow card for a bad foul. William Buckley (Birmingham City) wins a free kick in the defensive half. Substitution, Fulham. Matt Smith replaces Moussa Dembele. Foul by Rohan Ince (Fulham). Attempt missed. Clayton Donaldson (Birmingham City) right footed shot from the centre of the box is too high following a corner. David Davis (Birmingham City) hits the left post with a right footed shot from outside the box. Assisted by Jacques Maghoma following a corner. Corner, Birmingham City. Conceded by Michael Madl. Attempt blocked. David Davis (Birmingham City) right footed shot from outside the box is blocked. Assisted by Paul Caddis. Substitution, Birmingham City. William Buckley replaces David Cotterill. Attempt missed. Paul Caddis (Birmingham City) right footed shot from the right side of the box misses to the left. Assisted by David Cotterill. Substitution, Fulham. Ryan Fredericks replaces Emerson Hyndman. Substitution, Birmingham City. James Vaughan replaces Jon-Miquel Toral. Attempt saved. Paul Caddis (Birmingham City) left footed shot from outside the box is saved in the bottom left corner. Attempt blocked. Ross McCormack (Fulham) right footed shot from the centre of the box is blocked. Attempt missed. Tom Cairney (Fulham) left footed shot from outside the box is high and wide to the left following a set piece situation. Offside, Birmingham City. Michael Morrison tries a through ball, but David Cotterill is caught offside. Michael Madl (Fulham) is shown the yellow card for a bad foul.